Oh boy. Where have I been? The day after my accident I did a 50 minute run. Two days after I did an 11 mile run with Mark, Mike, and Joe VI. 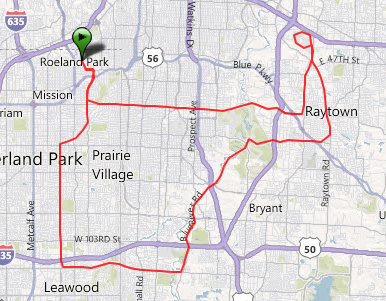 Four days I did a 42 mile ride around KC with Joe. The circle in the upper right corner is around the Truman Sports Complex. Tuesday through Friday? Nothing, really. I did go for a 60 minute run Wednesday but only made it 2 miles. I decided to stay out of the pool because it hurt too much to put any torque on my ribs. Sleeping sucked. I couldn't turn or sit-up without pain on my right rib cage. It still isn't an enjoyable experience. I keep saying that if it still hurts in 2 days I'm calling the doctor. I've been saying that for a week now. I haven't evaluated my training in over a week. I did decide to take last week quite easy. Partially because of the accident, partially because I've been catching up on geekiness (started working an iPhone app this week). The big reason we've been busy is today we celebrated my parents 40th anniversary and I prioritized the planning for it last week. It was quite an event as it was a surprise party and, thankfully, it stayed that way. My Mom has a tendency to sniff that stuff out pretty easily. So, I guess this is my week-in-review. I did 53 miles total. 42 bike and 11 running. Joe and I met up Saturday morning for a 9 mile run around downtown KC (Plaza and Westport area). So there's that. I've decided to take a couple weeks of my speed work period of my Half-Ironman Training program and instead redo a few weeks of my plan. I'll probably take a few more days off from the pool and get back around Wednesday this week. I'm really not that concern about the swim portion of the HIM but don't want to neglect it. I hope your ribs are feeling better today.